Excellent intelligent charger, Fitted in a camper van, the 12V supply function is very useful to provide a constant 12v supply. Can't fault the service. A small hiccup with the original order which was rectified without question. I would be happy to recommend them and I must say the people at the end of the phone were first class. The best battery charger I have ever used, with fast delivery. Excellent service and a good quality product .Received the item within days of ordering which was also well packaged . I found the price cheaper at TAYNA BATTERIES then anywhere else, . 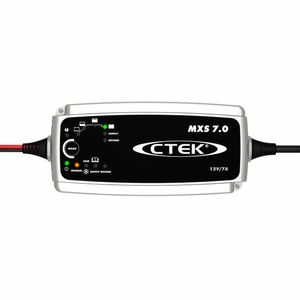 There may be cheaper alternatives, but in my experience CTEK chargers are always the best bet... For example the starter battery in my 14 year-old Merc SL 350 is still in perfect condition due to always being on 'conditioning charge' when not in use, via the MXS 7.0... no sulphation problems and the car starts first time, every time. A truly excellent product, and great service, as ever, from Tayna. Excellent piece of kit, easy to install, step by step indication of battery status and good value for money. Great service from Tayna and a great charger, recharged a completely flat battery so has paid for itself already. Bought the MXS 7 to charge my caravan leisure battery and it charged it fully within 12 hrs. Charged my car battery which was completely dead in under 8 hrs. Both are holding a charge and they would appear replenished. Great piece of kit for the £100 invested. A top notch charger, which is easy to use and keeps my leisure batteries in perfect working order. Really good product, this is our second one. It's my first time using Tanya, excellent service, prompt delivery. I have already recommended them to some of my colleagues. Thanks. Excellent service. Ordered on a Sunday and arrived Tuesday despite the fact that it was Christmas. Would have no hesitation in recommending to others. I upgraded from the smaller output 3.6 amp CTEC charger, the new 7.0 amp is a much more powerful unit and gives my 92 Ah AGM a full charge in less tha 12 hrs. I am well pleased with my purchase, Thank you. Product is excellent, I use it for charging all my classic cars and motorbikes. Delivery from Tayna was first class.